This volume looks at the transformation of international naval doctrines and tactics in light of advanced naval technologies. The publication provides information on how navies are transforming and what technologies they are utilizing in order to meet emerging threats in an uncertain global setting. Individual articles focus on integrated naval platforms, light weight torpedoes, mine hunting drones, tactical naval communications and C4ISR systems, as well as the achieving flexibility and adaptiveness through joint research and advanced technology demonstrations. Editorial. "Challenges of Naval Transformation." 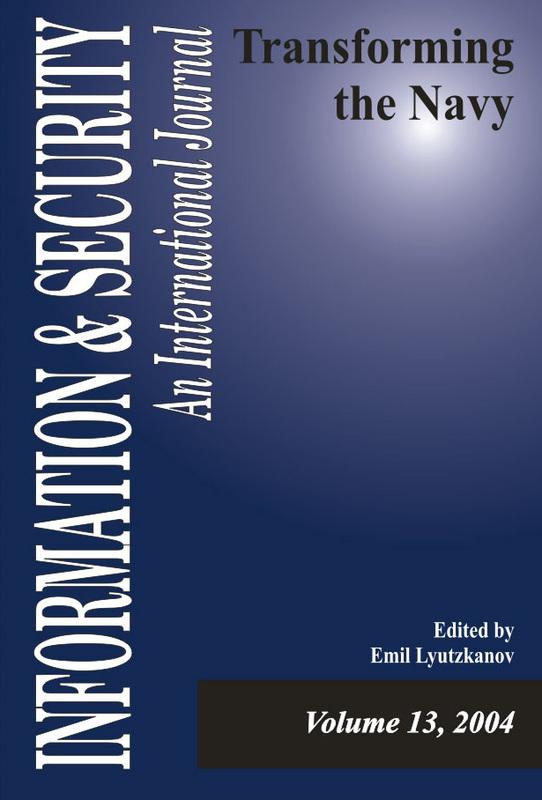 Information & Security: An International Journal 13 (2004): 5-6. Lyutzkanov, Emil. "Bulgaria in NATO:New Roles and Capabilities of the Navy." Information & Security: An International Journal 13 (2004): 9-24. Mednikarov, Boyan, and Peter Dereliev. "Structured Description of Naval Tasks." Information & Security: An International Journal 13 (2004): 25-34. Werft, Lürssen. "Naval Craft, Weapon and Sensor Systems." Information & Security: An International Journal 13 (2004): 51-76. Bussière, Olivier. "Advanced NATO-compatible Solutions for Surface Vessels." Information & Security: An International Journal 13 (2004): 77-86. Ceccarini, Claudio. "The Multi-Role NATO-Interoperable Light Weight Torpedo for the 21st Century." Information & Security: An International Journal 13 (2004): 89-97. Waquet, Philippe. "Mine Hunting with Drones." Information & Security: An International Journal 13 (2004): 98-111. Dereliev, Peter, and Boyan Mednikarov. "The C4I System Concept and the Control of National Sea Spaces." Information & Security: An International Journal 13 (2004): 115-125. Metzger, Stephen. "Current Trends in Tactical Naval Communications." Information & Security: An International Journal 13 (2004): 126-131. Monitor, ISIJ. "Naval Internet Sources." Information & Security: An International Journal 13 (2004): 135-136. Monitor, ISIJ. "AFCEA Bulgarian Chapter Varna." Information & Security: An International Journal 13 (2004): 137. Monitor, ISIJ. "AFCEA Varna Hosts Second International Conference on the Bulgarian Navy." Information & Security: An International Journal 13 (2004): 139-140. Monitor, ISIJ. "Fully Integrated Communications System for Frigates." Information & Security: An International Journal 13 (2004): 141.